Covering 25 hectares, Granite Island is the largest of the islands off the shore line adjacent to the township of Victor Harbor. The island has cultural significance to the traditional owners of the area, the Ramindjeri of the Ngarrenderi nation. Ngurunderi, the Supreme Creator, while chasing his wives from the Coorong to Kangaroo Island, threw his spears into the ocean creating the various islands and The Bluff. Geologically, the island, as its name suggests is composed of granite. Nowadays the exposed granite is tinged with green and orange lichen. At one stage a whaling station was located on the island but with the demise of the whaling industry the island became a sheep run. The Granite Island Run will take you on a quick trip around the island, covering many of its unique features. The 600 metre Causeway, which will form the first and last sections of The Granite Island Run, was built as part of a proposed safe anchorage. At one stage swimming baths were constructed along the causeway, but these were demolished following a large storm. Each year hundreds of thousands of tourists make the journey across the Causeway to the island by foot, or on the famous Horse Drawn Tram. As you run along the eastern section of the island you will follow the tracks used in the past by carriages moving agricultural produce for shipment around Australia and overseas. You will pass the Penguin Centre on your right and if you are close enough to the edge, see the carved seal on top of a rock. The tracks originally lead to The Screwpile Jetty which was constructed by screwing large pylons into the seabed, hence its name. Here you might see some early morning fishers trying for the daily catch, so don’t get caught in the lines. Here the Race Director decided to show some sympathy (Hahaha, no sympathy in 2018) and elected not to include the stairway of timber steps to the top of the island. On your way back you will pass the large quarry on your left. Granite from the quarry was used to build the breakwater. The breakwater, built to protect the anchored vessels in Port Victor, was part of a plan to see Victor Harbor as the State’s capital city. Just before you get to the causeway you will take a sharp left turn and climb up approximately 30 metres to the highest point of the island. In days gone by you could have opted to take the chair lift. Believe it or not a small plane has landed on the top of the island. Heading south towards the beacon on the cliffs you will have a view all the way to the mouth of the Murray River and the Bluff. A right turn will see you heading along the southern side of the island with its granite outcrops and crashing waves. Keep your eyes open as you don’t want to end up like Miss Dutton who was swept to her death in 1892. On either side of the tracks you may see the many burrows which are the homes of the island’s Fairy Penguin population. 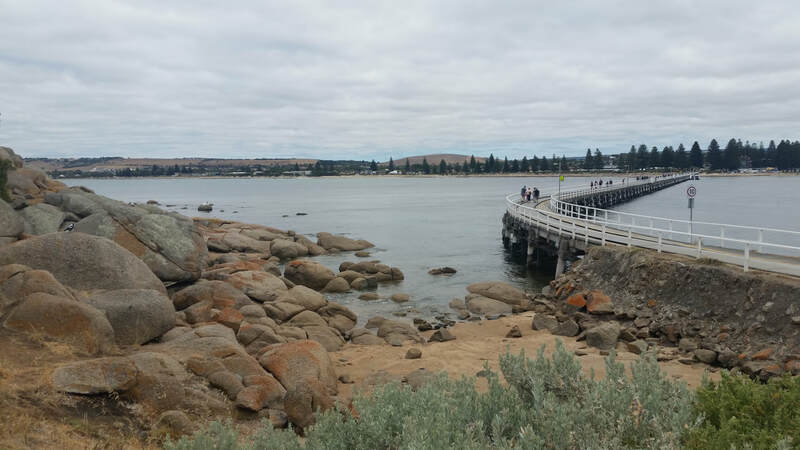 The track will take you back in the direction of the centre of Victor Harbor and you will head down a board walk section towards the causeway again. At the bottom of the boardwalk the race director turns you around and directs you to return to the crest of the island before making a sharp descent. Here you will get a spectacular view of Victor Harbor and the surrounding hills. As you head over the causeway to the finish line you will be able to take in more views either side. Those of you who have opted for the long run get to do it again, giving you the opportunity to once again take in the view which the Race Director takes for granted on his early morning runs.